Steam now has full support for alpha and beta releases, complete with developer announcements and user feedback. There once was a time when games were considered "complete", meaning developers crafted the best possible experience within a single release. Digital distribution effectively ended that system, for better or worse, but the early release schedule provides a lucrative upside. Popularized by Minecraft, this model makes a game available in its alpha or beta state, letting customers play early while developers gain invaluable feedback for further updates. It's a system increasingly being used by established and indie developers alike, so naturally, Valve Software wants to bring the experience to Steam. The digital publisher has recently announced its Early Release program, allowing gamers to purchase alpha and beta releases while developers take advantage of Steam Community feedback reports. 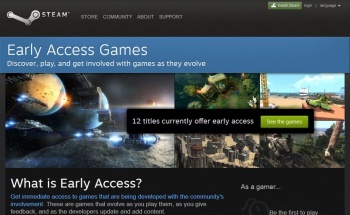 On Steam's Store page, users can find Early Access titles conveniently linked under the Games Tab. The current release list is fairly small, but includes everything from indie titles like StarForge and Kerbal Space Program to Bohemia Interactive's Arma III alpha. Once the player finds an early release they like, it can be purchased (or in some cases, played for free) and discussed within game-specific comment boards. Thanks to Steam's update process, early release developers can use these comments to implement quick bug fixes, at which point the process repeats itself. As cliched as Valve success stories have become, it's hard to imagine the Early Release Program being anything but. The alpha release model attracted thousands when Minecraft popularized it. Combined with the monetary income and feedback of Steam's massive community, the inherent opportunities could have developers shaking with glee. Valve has invited all Greenlight and traditional-entry developers to make contact if they're interested, but for players, several titles are already available to play and test.